Assisted Living in Sacramento – Sacramento is a capital of California. Luvdid.com has listing of more than 2000+ in Sacramento. Living in this beautiful city, If you looking for the best assisted living or care homes for your Senior family member or for yourself? here you are at right place. We understand your problem and brought you the best features. Now you don’t need to search further for this. Read below to know more. You may see there are many companies help you Find the Assisted living facility for Elderly with the different brand name and trained experts, but this requires time to step up time to talk to experts and keep searching, But choosing the best one for your loved ones or for yourself can make you confuse. 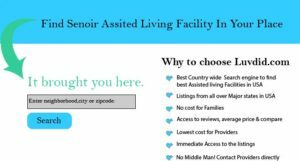 Click here to redirect to Low Income Assisted Living – Sacramento CA. Assisted Living Facilities total number of percentage is increasing day by day of people who are connected with the assisted living. Because it very important for families knowing your loved one is safe, cared for, and enjoying the best possible quality of life for seniors reducing their ill sufferings. Choosing the best option for your loved ones can be a very important as when they shift to assisted living , we need to be sure that we made the best choice and they are in safe hands. Just to make your choice easy and trustworthy, here we have a list of homes which you can choose for your family. Here are the listings of Assisted living for those seven cities in Sacramento. Assisted living In Citrus Heights,CA. Assisted living In carmichael CA . Assisted living In ElK Grove, CA. Assisted living In Folsom, CA. Assisted living In Galt, CA. Assisted living In Rancho Cordova, CA. Assisted living In Sacramento City, CA. The demand for care homes is high in Sacramento, CA. The city Sacramento in California has the approx population of 495,234. And there are many care home providers which provide the best services facilities to people. So, if you are looking for the best one you can choose any of above mentioned. And the cost of the same also varies according to their services. The median cost for a private, one bedroom of an apartment in city Sacramento is near about $3,500 per month or $42,000 per year. Luvdid is the provides best care services to people who are staying in Sacramento. The care home has great facilities, good environment to live and trained staff members. We hope, we provided you the best information regarding this that all you need to know. You people can also visit our official website. Choose the best living facilities in Sacramento for your loved ones or for yourself and stay happy. Connect yourself with the best services and avail all the benefits.